It was another quiet month for Vancouver’s detached housing market. Sales are already tricking in at their lowest count in recent history, and the month of August didn’t fare any better. There were just 116 home sales in the month of August, that was down 30% from a year ago. 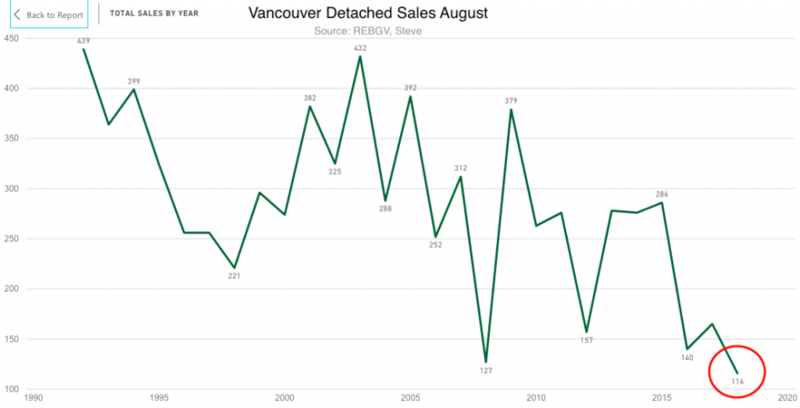 Vancouver Detached home sales history for August. Sales were even lower than August 2016, when home sales crashed after the BC Government abruptly introduced a 15% foreign buyers tax. The count was also lower than August 2008 when liquidity had seized up across the world, just months prior to the collapse of Lehman Brothers. While volumes sit at record lows, inventory has been slowly creeping higher. Total homes for sale edged higher by just 1% from a year prior. However, inventory for the month of August hasn’t been this high since August 2012. 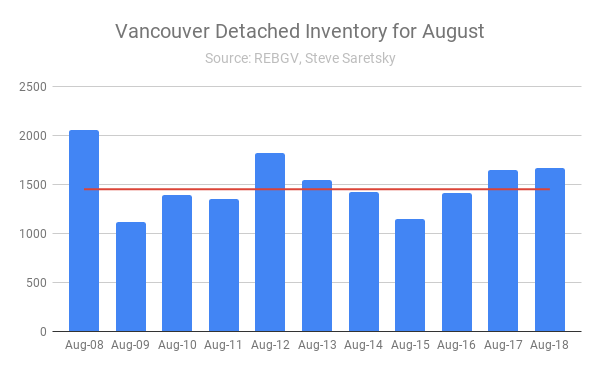 Vancouver Detached inventory for August & 10 year average. While prices remain incredibly sticky, as they always are in a real estate downturn, there is no doubt they are sliding lower. This is particularly the case in Vancouver’s west side where many detached homes are trading back near 2015 prices, erasing a good portion of the bull market run-up. The Real Estate Board’s official MLS benchmark now shows a 6.5% decline year over year, however the reality is much worse. For illustrative purposes, here’s the 3 month rolling average, which shows detached prices in Vancouver peaked in April 2016 and have since declined 18%. 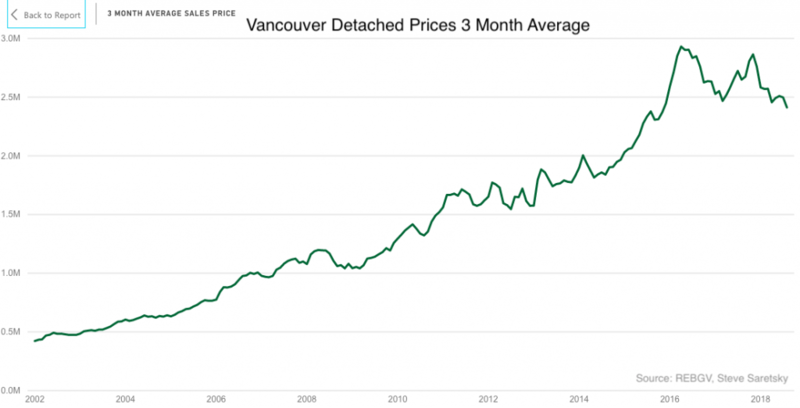 Vancouver detached prices using a 3 month rolling average. Meanwhile, new listings remain weak, declining 17% compared to August 2017. This suggests, along with low sales volumes, that sellers haven’t hit the panic button just yet.